Prime Minister Tony Blair has said he will push on with ID cards - insisting that as with CCTV and DNA the issue is one of "modernity" not civil liberties. An "action plan" would be published by the Home Office in December to "explore the benefits" people could get from ID cards in 10 years' time, he said. He told his monthly news briefing all non-EU nationals will need them to work or access public services from 2008. But he also confirmed the timetable for Britons' cards has slipped to 2009. 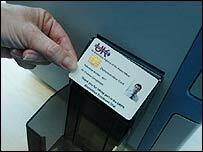 The Tories and Lib Dems oppose ID cards - which are not due to become compulsory until at least 2010 - and say they would scrap them if they got into power. Mr Blair said ID cards would become compulsory first for non-EU overseas residents who come to Britain for more than three months. They would help tackle illegal immigration, terrorism and identity fraud, while also protecting the vulnerable and the solving of crimes, he said. Mr Blair dismissed critics of the scheme's cost, insisting the project was on budget. He said biometric passports had to be introduced anyway and they made up 70% of the cost of ID cards. Mr Blair, who also highlighted government IT schemes which he said showed such a large database could be made to work, said he wanted to make a major effort to sell the potential gains for people. "We need to lift our sights a little. I don't think, in the debate so far, that we have even begun to explore the benefits that we will see in, say, ten years time," he said. "We are building a new part of our national infrastructure here. And like other such projects the gains to citizens will be much larger and more extensive than anyone could say at the time," he added. ID cards and other issues, such as measures to tackle anti-social behaviour, CCTV cameras and the growing DNA database, were often portrayed as civil liberties issues, he said. But he believed that it was more an issue of "modernity" and of "modern life" - and he backed the use of these new technologies to tackle the new types of crime. For the Conservatives, shadow home secretary David Davis said: "He claims they will deal with benefit fraud, whilst his own minister pointed out that 95% of benefit fraud is caused by people lying about their circumstances, not their identity. "He claims they will tackle terrorism, whilst his home secretary on the 7th July last year said 'I doubt it would make a difference'. "And he claims it will tackle identity fraud when Microsoft tells us it is more likely to trigger identity fraud on a massive scale.... it will almost certainly cost £20bn, will solve very few problems... it will be Labour¿s final act of ineffective and expensive authoritarianism." For the Liberal Democrats, home affairs spokesman Nick Clegg said: "Tony Blair must be living in cloud-cuckoo land if he seriously believes that the creation of the world's largest identity database will be a magic cure for identity fraud. "All the evidence from Britain and abroad shows that big government databases just become the favoured target for ever more sophisticated organised criminals."